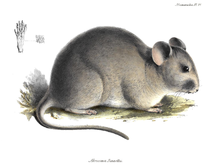 Chinchilla rats or chinchillones are members of the family Abrocomidae. This family has few members compared to most rodent families, with only nine known living species. They resemble chinchillas in appearance, with a similar soft fur and silvery-grey color, but have a body structure more like a short-tailed rat. They are social, tunnel-dwelling animals, and live in the Andes Mountains of South America. They are probably herbivorous, although this is not clear. ^ Huchon, D. and E. J. P. Douzery (2001). "From the Old World to the New World: a molecular chronicle of the phylogeny and biogeography of hystricognath rodents". Molecular Phylogenetics and Evolution. 20 (2): 238–251. doi:10.1006/mpev.2001.0961. PMID 11476632. This page was last edited on 5 February 2019, at 03:08 (UTC).